The U.S. Census Bureau reported that the annual U.S. trade deficit in goods and services increased from $504.8 billion to $566.1 billion from 2016 to 2017, an increase of $61.2 billion (12.1 percent). The rapid growth of the overall U.S. trade deficit reflects the failure of Trump administration trade policies to materially affect trade flows in its first year, and its failure to address currency misalignment and prolonged overvaluation of the U.S. dollar. The U.S. goods trade deficit increased from $752.5 billion in 2016 to $810.0 billion in 2017, an increase of $57.5 billion (7.6 percent). The U.S. goods trade deficit is dominated by the trade deficit in manufactured products (including re-exports), which increased from $648.7 billion in 2016 to $699.8 in 2017, an increase of $51.1 billion (7.9 percent). Rapidly growing trade deficits in manufactured goods are a threat to future employment in this sector, which remains a large employer despite decades of policy-inflicted decline. The U.S. trade deficit with China reached a new record of $375.2 billion in 2017, up from $347 billion in 2016, an increase of $28.2 billion (8.1 percent). China is a particular source of concern in trade in steel and aluminum, industries in which that country has accumulated massive amounts of subsidized, and often state-owned excess production capacity, over the past two decades. The president needs to promptly take trade action in pending national security investigations in these sectors. The remainder of the goods trade deficit is composed of trade in petroleum and other energy products, and miscellaneous transactions. The United States also had a small trade surplus in agricultural commodities, which reached $22.1 billion (including re-exports) in 2017. The U.S. surplus in services trade declined from $247.7 billion in 2016 to $244.0 billion in 2017, a decline of $3.7 billion (1.5 percent). The most important cause of large and growing U.S. trade deficits is persistent currency undervaluation by countries such as China, Japan, and Korea, which have run large, persistent trade surpluses, as well as large structural surpluses accumulated by Germany. The real, trade-weighted value of the U.S. dollar increased sharply in 2014 and 2015, as shown below. Although the dollar declined in the 12 months ending in January 2018, on average it was 16 percent higher than in 2013. 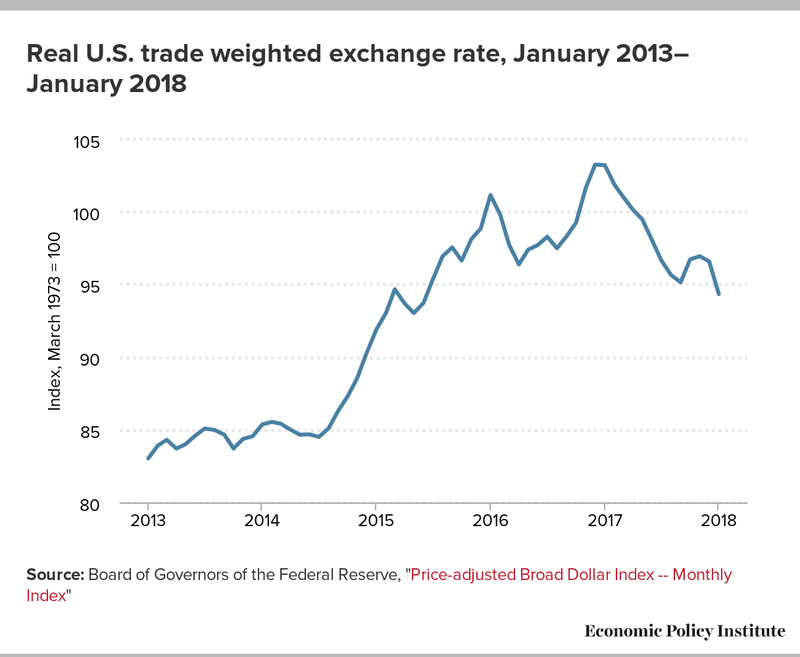 The dollar affects trade flows with a lag of about two years, and the dollar increase in 2014–15 was the most important cause of the sharp increase in the trade deficit in 2017. The United States is likely to incur growing trade deficits unless and until steps are taken to re-align the dollar with the undervalued currencies of countries with persistent trade surpluses. Recent dollar depreciation is unlikely to constitute a durable solution to the trade deficit unless it is reinforced by a policy commitment to keep it at competitive levels. The Trump tax cuts will add more than $1 trillion to U.S. fiscal deficits over the next decade, putting upward pressure on interest rates and the U.S. dollar. Absent aggressive efforts to reduce the overvalued dollar, policies of trading partners and the vagaries of financial markets will soon lead to a rising dollar, putting continued upward pressure on the trade deficit, and downward pressure on employment and output in U.S. manufacturing. Source: Board of Governors of the Federal Reserve, "Price-adjusted Broad Dollar Index -- Monthly Index"